You will need tons of patience and will power. It takes time for you to be comfortable riding the surf board. Let alone to actually "surf" it. It might take you forever before you can ride to the shore, but never lose hope. Never give up on those waves. Timing, not just on your surf ride, but also when you plan to hit the beach is a crucial factor. Summer months are best for newbies when the waves are calmer. Leave the 'Ber' months to the pros. Day 2 of surfing lessons. So how do you go about getting surfing lessons? 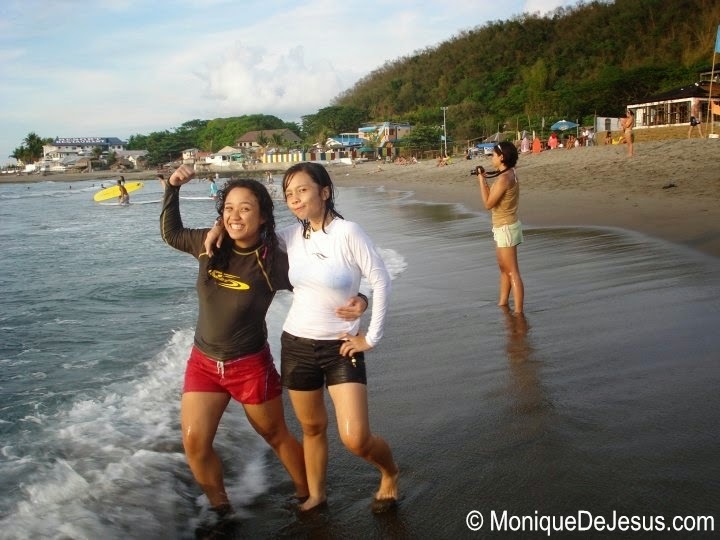 For first timers, easiest way is to find a tour organizer and avail of a surfing trip package. It's what we did. This usually comes with accommodation, transportation, surfing lessons, a meal or two. This is useful for first-timers who have no idea how to go about it or too lazy to research. Or you can DIY the trip, use the power of the internet - research! Rent a van or drive yourselves, long road trip is fun with friends, you can stop along the way to eat in local restaurants. Book an accommodation. Hire surfing instructors at the beach and rent surf boards from them. No worries, there are lots! You can also ask from your hotel/lodge for assistance. 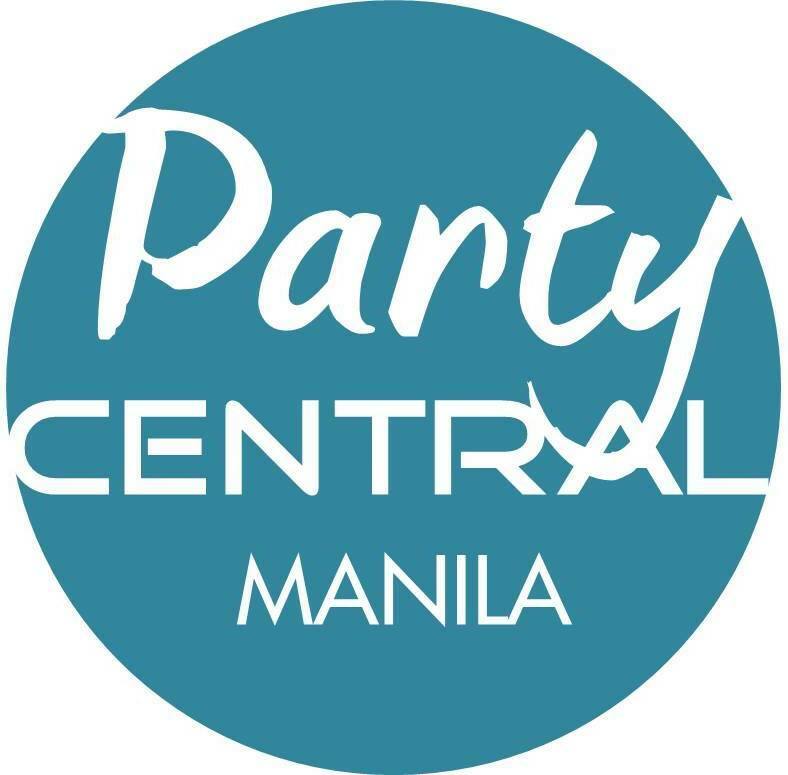 They usually cost around Php200/hour for the instructor and board each, so total of Php400/hr - at that time (must have increased a bit now). And 1 hour seems so be forever on your first time, I'm telling you. How do surfing lessons work? Once you are all settled and ready for the surfing lesson, you surfing instructor will brief you on the do's and dont's and the basic of surfing. He should first do a demo and let you do exercises on land before hitting the water to make sure you know the proper ways of paddling, carrying the board and mastering the stance. Once you are ready, the most exciting part comes. Your instructor will let you ride the surf board lying on your front. This is a get-ready position to stand once your instructor lets you go to "show him what you got". He will bring you farther from the shore. This is a pretty fun ride wherein you will collide with waves head on. Your instructor will find a spot where you two will wait for the right wave for you. You cannot see it. You must trust your instructor to tell you that it's time. When it comes he will let you know, release your board, and it's all on you. When you fall, don't panic. Just remember your instructor's guidelines and you will be fine. You will not fall in deep water that's for sure. Your worst enemy is your board. Worst thing that could happen - your board hitting you or getting ran over by other surfers. Or could be looking like a tramp once you walk onto the shore for an after-ride pose. Drowning is unlikely (but not impossible if wave conditon is extreme). Instructor said: never get your board! Be friends with your surfing instructor. Sometimes you just cannot choose who will give you surfing lessons, but whoever he is, try to be friends with him. It is important that you trust your instructor and you are comfortable with him. He is in-charge of your life during the surfing lesson, sort of. See how I am friends with mine? Be prepared to get ugly. You can look really awful after a "tragic" fall You will lose your poise because saving your life and not getting hurt are your utmost priorities when in the water. So be ready to get ugly. Be prepared to get hurt. Sorry to say that even if you lost your poise to avoid getting hurt or just because the waves wanted you to, you will still get hurt. A little bruise, scratch and cut here and there cannot be avoided, as well as in other sports. So if you are not up to that, sorry to say surfing is not for you. For photo, refer to above. It's up to you if you want to flaunt your new bikini while riding the board, it would look super hot if you imagine and your photo will sure be FB profile pic-worthy, like in the movies, right? However, it does not work that way. (Sarreehh) Especially that you are a newbie. Remember? Uncomfortable swim wear is the last thing you need to distract you from getting a good ride. Flashing your boobies after a tragic ride (or fall) is not cool at all. Rash guards are a must. You can wear bikini bottoms all right. You can wear comfy board shorts too. After my first surfing experience, I would want to wear leggings if I can. Your swimwear must do a good job protecting your skin. 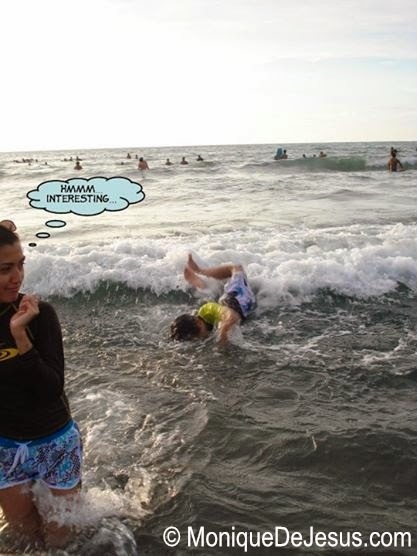 I was wearing a long-sleeved rash guard then, and still I got bad wounds on both elbows, same on both knees. Notice the band-aids on both my knees. And still I am on for another day of surfing lesson! YOLO! Soft board works better for me. 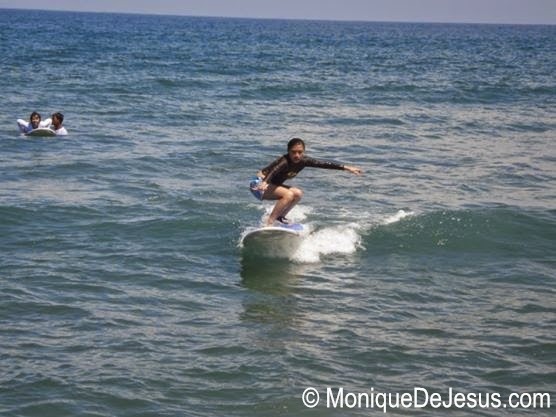 The very first time I tried surfing in San Juan, La Union, my instructor let me use a hard board. I had a really difficult time riding it. But the next morning I was able to use a soft board, and voila! It's more stable, thicker and easier to use. So you can ask if there's a soft board available for you when you visit a surfing destination. I think it is important you get a decent ride and feel comfortable in the sea riding a surf board on your first try so your confidence will not be washed out too by the waves. A local kid showing us how it's done. My sister and cousin (L-R) looking so young. Now they have grown into really gorgeous ladies. 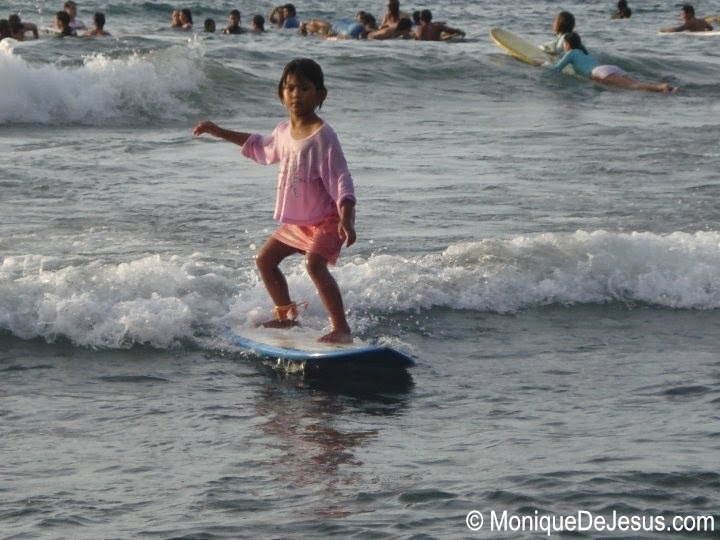 That's me with my pink board in Bagasbas, Camarines Norte smiling after a ride. Or a fall, can't really remember. PS: At night, we visited Halo Halo de Iloko for some local delicacies. Not to miss!